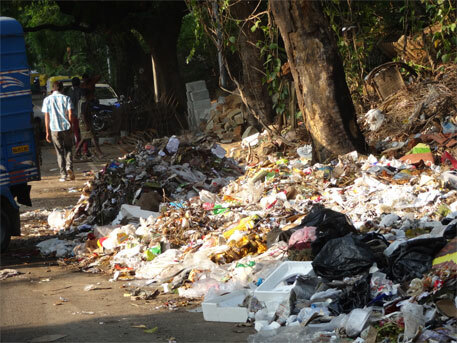 The Ministry of Environment, Forest and Climate Change (MoEFCC) was forced to call off the national consultation on the draft Municipal Solid Waste (Handling &Management) Rules, 2015, in Bengaluru on May 22 amidst protests. Environmental activists and civil society groups opposed the convention as they felt it lacked transparency. The consultation was meant to cover all the five southern states—Andhra Pradesh, Kerala, Karnataka, Telangana and Tamil Nadu. The environment ministry organised the “Stakeholders’ Consultation on Draft Waste Management Rules, 2015” in partnership with the Central Pollution Control Board (CPCB), the Federation of Indian Chambers of Commerce and Industry (FICCI) and the Confederation of Indian Industry (CII). “The consultation was unconstitutional, undemocratic and illegal from the very beginning,” Leo F Saldanha of Environment Support Group (ESG), a Bengaluru-based non-profit, said. The consultation should have been conducted either by the State Pollution Control Board (SPCB) or the state Department of Environment and Climate Change. Instead, the ministry outsourced the essential executive function of formation of rules to corporates, he added. In April, the MoEFCC put up a release on the draft solid waste management rules on its website for public viewing and comment. “It was not clear from the release whether the draft rules were notified in the gazette within the 60-day timeframe as per the rules before public consultation,” Saldanha said. However, it was categorically stated on the website that the ministry was planning national consultations on the issue. The release also said that such programmes would be organised on May 1 in New Delhi, May 8 in Mumbai, May 22 in Bengaluru and June 5 in Kolkata, in partnership with CPCB, FICCI and CII. The ministry said that with “the government’s special impetus on Clean India Mission in consonance with Make in India and ease of doing business, these amendments are timely endeavours towards meeting these initiatives of the government”. All the invited stakeholders should ensure their participation, the release read. “Subsequent to this release, the ministry did not issue any public advertisements inviting people to engage in the consultations,” Saldanha added. The Delhi consultation was presided over by Union environment minister Prakash Javadekar. Also, nowhere on the ministry’s website there was any mention that other consultations would also be held, barring those organised by CII and FICCI. The Bengaluru consultation was organised at Le Meridian, a five-star hotel. E-mail invitations were sent out and the participation was restricted to invitees who had registered themselves in advance. “This invitation exercise was undertaken with such secrecy that not even the Solid Waste Management Expert Committee members constituted by Bruhat Bengaluru Mahanagara Palike (BBMP), the municipal corporation, were invited,” Bhargavi S Rao of ESG said. Petitioners, who had lodged public interest litigations before the Karnataka High Court advocating progressive, just and environmentally-viable waste management strategies, were also not invited. “CII officials resisted my entry to the forum even after my informing them that I would be participating as a petitioner in the waste management case before the Karnataka High Court,” Rao added. The programme started smoothly when Shekar Viswanath, the chairperson of Karnataka CII, welcomed Vaman Acharya, the chairperson of Karnataka SPCB and Biswanath Sinha, MoEFCC joint secretary, to preside over the consultation. However, activists raised their voice soon after and questioned the ministry’s action of making industry bodies partners in organising the consultation. “Nowhere in the constitution or in the Environment (Protection) Act, there is any mention that the responsibility of formulating rules and legislations can be outsourced to bodies such as the CII. This is unconstitutional and illegal,” said Saldanha. He demanded that the ministry should reorganise the consultations on its own or through competent government organisations such as SPCBs or the environment departments of respective states. Wilma Rodrigues of Saahas, a Bengaluru-based non-profit working towards zero waste management, demanded that all the consultations held till now must be organised again to ensure people’s participation. Bhoga Nanjunda of Bengaluru-based CIEDS Collective, a group working on development issues, wanted to know whether the ministry appreciated the deep and wide-ranging ramifications of legislations on solid waste. “What indeed is the difficulty in being transparent and accountable to the public?” he asked. Civil society representatives demanded that the MoEFCC hold the consultations at public venues rather than five-star hotels and issue notices in advance through advertisements in local newspapers. After listening to the protests, Sinha first made efforts to justify the consultation. “This national consultation is the first of many consultations that will follow, and we assure that there will be a separate consultation with civil society groups,” he added. However, the activists were not convinced. They took a firm stand, saying that the consultation was not acceptable. Finally, after not being able to come up with any convincing reply, Sinha cancelled the consultation.